January 6, 2011 - Gulfstream Aerospace recently received approval from Transport Canada for the company’s large-cabin, long-range Gulfstream G450 and G350 aircraft to operate at their maximum cruise altitude of 45,000 feet. Transport Canada normally restricts flight to 41,000 feet or below, unless special conditions have been met to ensure against rapid depressurization of the aircraft cabin. Gulfstream’s Automatic Emergency Descent Mode (AEDM) was key to obtaining this higher operational altitude. AEDM mitigates the risk of occupant injury due to rapid depressurization by automatically lowering the aircraft to the appropriate altitude. Should the pilots become incapacitated due to depressurization. The AEDM automatically turns the aircraft 90 degrees and lowers it to 15,000 feet (4,572 m) altitude and 250 knots air speed. This maneuver allows the flight crew to regain consciousness and assume control of the aircraft. The G450 and G350 join the GV, G550 and G500 in being authorized by Transport Canada to fly at their maximum certified altitudes. The G550 and G500 were already approved to operate at 51,000 feet, because they are equipped with both AEDM and a secondary pressure bulkhead that can maintain cabin pressurization in the unlikely event of an uncontained engine failure. These attributes enable the aircraft to meet Transport Canada’s high altitude special conditions. Flying at higher altitudes allows aircraft to avoid traffic congestion and adverse weather. It also provides for more fuel-efficient operation. 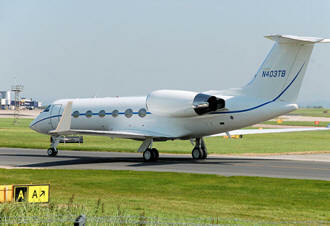 The G450 is an improved version of the GIV-SP/G400 using technologies from the G500/G550 (an upgrade to the GV). It has a "PlaneView" cockpit with 4 Honeywell 21 EFIS screens, and a Gulfstream-designed cursor control system. It also has the "Enhanced Vision System" (EVS), an infrared camera that displays an image of the view in front of the camera on a head up display. EVS permits the aircraft to land in lower-visibility instrument meteorological conditions than a non-EVS-equipped aircraft.